Had nothing better to do so I though that I'll do a botteling and pitching-from-cube "pictorial". 1. Bottles washed and on the bottle tree. I normally rinse my bottles immediately after pouring a beer. On botteling day I just rinse the bottels with warm water and then rinse them with Iodiophor or Starsan. After that, onto the botteling tree. If I get bottles from other people I would soak them in a cleaner (VWP/Oxyclear/Bleach) for an hour or so before rinsing. 3. Pulling and squeezing the dry hops bag. This brew was chilled at 0C for 10 days. 4. Syphoning the beer into the botteling bucket. I've batch primed this beer and added the boiled sugar and water mix just before I've started the syphon. 5. Jiggler syphon - I don't think I'll be able to brew without this little gadget. I use it tor transfer hot wort to the cube, cube to fermentor and fermentor to the botteling bucket. 6. I've measured the beer that remained - a shade over 400ml... Not too shabby for a around 20L VIP. 7. Ready to bottle. I always bottle into different bottle sizes and the mini keg. I had a lot of promblems with the mini keg leaking CO2 but I think that's finally sorted. Bottle caps in Idiophor solution. Spray bottles filled with Starsan and Idiophor close at hand. And the taster from the trail jar after taking the FG. All my beers that have tasted very good at bottling stage has turned out really well - this beer was particularly nice - it's a Jaipur IPA clone. 8. Filling a 5l mini keg and not fearing the Starsan foam! 9. 20l of packaged beer - capping the yellow caps took about 2 minutes with the bench capper. Last edited by lambert on 14 Jan 2013, 04:59, edited 2 times in total. 1. Poured about 1.7L of boiled and cooled water into the yeast cake of the beer that was bottled. Decanted it to a large jug and poured the top "clean" yeast to this flask after about 15 minutes. 2. Idiophor the cube around the opening. 3. Transfer from cube to fermentor. I splash it around to oxygenate the wort as best as I could. I'm pitching a large healthy yeast so I'm not too fussed about getting a lot of oxygen in the wort. 4. Yeast pitched and ready for the fermentation "chamber". Last edited by lambert on 14 Jan 2013, 05:01, edited 2 times in total. Excellent! I really enjoyed that! Would one of thse co2 cans that are used for dusting keyboards and such,work for that type of purpose too? Or does it need to be some kind of food grade stuff? "Gas duster, also known as canned air or compressed air, is a product used for cleaning electronic equipment and other sensitive devices that cannot be cleaned using water. Despite the name "canned air," the cans actually contain gases that are much easier to compress into liquids, such as difluoroethane, trifluoroethane, or tetrafluoroethane." Last edited by thughes on 14 Jan 2013, 09:41, edited 2 times in total. Brilliant pictorial Lambert. That's a cracking fermenter as well; where did you get that? I have the same bottling tree (80 not 40), and i use the Vinator to rinse the bottles, saves a lot of time. I use a racking cane, but it looks like your jiggler is easier to use, would you recommend it? good tip with the C02 purge; i have never had that problem luckily. I also use the coopers PET bottles so i can squeeze the air out of these and cap them with no gas headspace whatsoever as well. I would be interested in your mini keg "exploits" too. I have thought about trying this, but never got around to it. Last edited by mally on 14 Jan 2013, 16:40, edited 2 times in total. Last edited by Lars on 14 Jan 2013, 22:58, edited 2 times in total. Lylo - I use the CO2 cartridges for my bicycle pump and mini keg. I think it's plain CO2 and that is pretty inert?! I haven't gone yet! mally - I got the fermenter from here. Search for Demijohn or product code 017.125.6. It's a bit pricey but I like the glass - I can see stuff happening and it's easy to clean! As I said in the post - the jiggler/auto syphon is GREAT. (Note - Lylo initially put me on the trail of the jiggler - kudos to him) The one in the UK got bad reviews on Amazon but my has lasted for 40 brews (2-3 syphon's per brew) and I'm well chuffed. In the US you are able to get different sizes and I know some HBS in Australia supply a stainless steel jiggler . 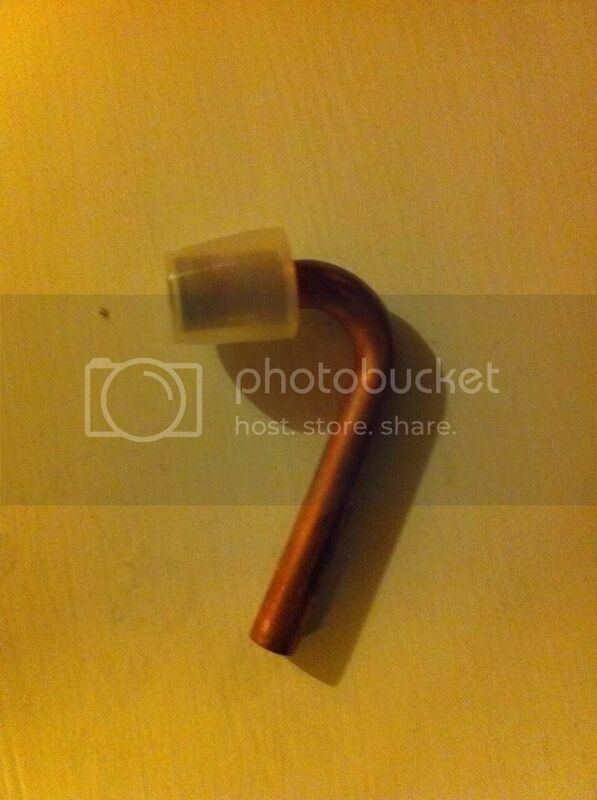 Will do a separate post on the mini keg - a major problem was fixed by a simple o-ring! 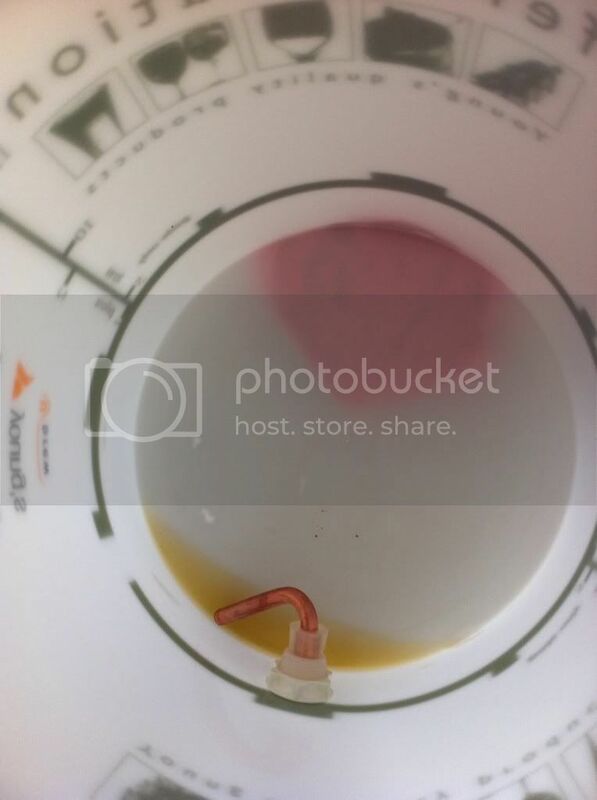 I've recently discovered that one can get get food grade nitrogen cartridges (made for whipping cream) that also fits the mini keg tap so I'm going to brew a Red Ale soon and dispense it with nitrogen. Lars - Awesome! Great! Man, something so simple will help a lot - I always tip the bottling bucket towards me for the last 2 liters and I know that it's an accident waiting to happen. That dip tube will make such a difference. Thanks for posting the pics! Last edited by lambert on 14 Jan 2013, 23:48, edited 2 times in total. The drain on your bucket is interesting. I use a "Invert Tube Backnut"
Food grade nylon, custom-molded to include an integral backnut. Keeps beer (and yeast sediment) out of the Transfer Valve during fermentation. Fits our Bottling Valve above, or any valve with 3/4” tapered male pipe threads. Last edited by BobBrews on 15 Jan 2013, 01:36, edited 2 times in total. Well done Bertie, great write up. 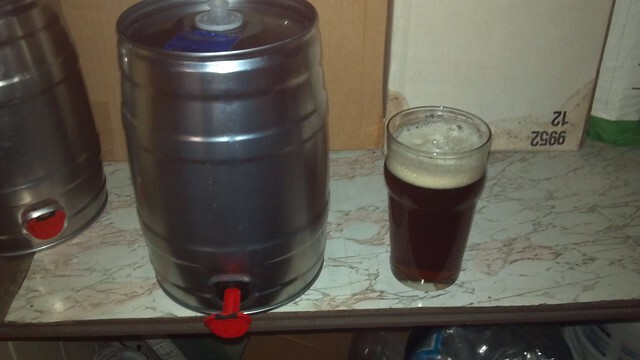 I use the mini-kegs with the built-in bottom tap for my cask ales. Prime with tablespoon of sugar for 7-10 days......once carbed simply bring keg to cellar temps, vent for 24 hours, and then serve. Last edited by thughes on 15 Jan 2013, 02:11, edited 2 times in total. [quote="thughes"]I use the mini-kegs with the built-in bottom tap for my cask ales. Prime with tablespoon of sugar for 7-10 days......once carbed simply bring keg to cellar temps, vent for 24 hours, and then serve. Vent for 24hrs ?? why do you do this ? is it to vent excess pressure ? Yeasty wrote: Vent for 24hrs ?? why do you do this ? is it to vent excess pressure ? The amount of residual carbonation in the beer is directly depentant upon the temperature: cold beer will retain more CO2 that warm beer therefore it is important to get the beer to temp that provides the desired level of carbonation. Last edited by thughes on 15 Jan 2013, 02:43, edited 2 times in total. Bobrews That back-nut is nice - pity we cant get it here in the UK. But it's got me thinking - a normal female tap connector with a bent pipe... Hmmm. 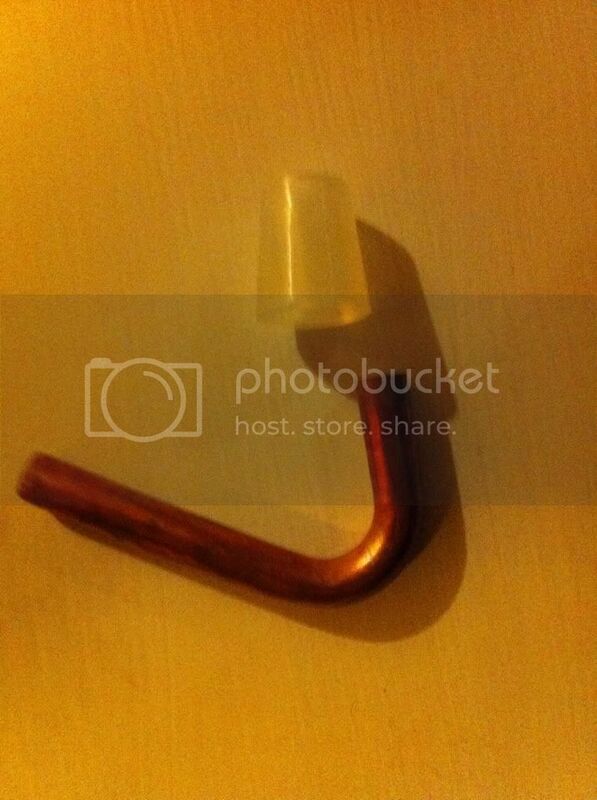 Oh, it's Lars who posted the rubber bung and drain. Todd I once had a very nice beer from a craft brewery in one of those bottom tap kegs. Problem was that I did not know that the beer would spoil so quickly and we basically had to dump half the keg. I might be able to manage 5L over a weekend but it's a big ask for a week night. You do know that you get a pressure release valve for these kegs Linky? Last edited by lambert on 15 Jan 2013, 03:22, edited 2 times in total. Lars - do you have any more info on that dip tube, where you got the bung etc? BobBrews invert tube backnut looks great, but i cannot find a supplier here as Lambert stated. My racking cane is a PITA to clean & i find unwieldy to use most times, so the jiggler/siphon looks like a better solution. Lambert - do you use it for hot wort at all? I am not sure if yours is designed to work with hot liquids (I know you can change the tubing to silicon). If it is not suitable then i would like to ask our antipodean friends; would you recommend the Gryphon brewing stainless steel jiggler? I have read this is OK for hot wort with silicon tubing. Again there is no source for it here that i can find, and Gryphon will not post internationally. I'm using the the jiggler to transfer near boiling wort - no problems at all - at least not for the 40x use with transferring 20L of hot wort. Thick silicon hose is required - the 3/8" Silicone Tubing fits perfectly over the jiggler. I got mine from http://www.the-home-brew-shop.co.uk/. It's rated to 120C. Just remember to wear gloves when transferring hot wort - the tubing gets quite hot. Last edited by lambert on 15 Jan 2013, 19:35, edited 2 times in total. So, is there any chance of you starting a whole new thread/tutorial on 5 L kegs? It would open up some amazing opportunities in my brewing. I bought several of the 5 litre minikegs on-line for @ $18 USD each. The ones I purchased have a built-in gravity tap install but you can get them without the built-in tap and either use a hand pump tap or a CO2 tap to serve from. The CO2 taps are expensive! The benefit is that your beer will last much longer after you tap it. I bought a hand pump tap (cheap!) but after one use it just sits in a box as I am happy to use the built in taps and gravity serve. My method is to tap a fresh keg on Friday when I get home from work, I can easily finish 5 litres over the weekend (before the beer goes bad). You mentioned the Heineken mini kegs....these will NOT work as they (and a few others....Newcastle being another one I am aware of) use a proprietary system not compatible with the standard mini keg equipment. As for purchasing kegs.....as I stated earlier I found them on Amazon but I also discovered that my local craft beer shop/importer has 5l minikegs with the built in tap for sale at the same price I payed, except THEY ARE FULL OF BEER!. Last edited by thughes on 16 Jan 2013, 22:18, edited 2 times in total. Bugger me! At least I now know of ONE brewing thing that is cheaper in the old world vs the US! Candirect. Click Kegs, Tanks and Storage and then on 5 Liter Party kegs. Euro 5.5 (that is $7.3USD or £4.5 in proper money) per keg . I use the kegs without the build in taps, they are even cheaper. thughes wrote: The CO2 taps are expensive! The benefit is that your beer will last much longer after you tap it. I bought a hand pump tap (cheap!) but after one use it just sits in a box as I am happy to use the built in taps and gravity serve. My method is to tap a fresh keg on Friday when I get home from work, I can easily finish 5 litres over the weekend (before the beer goes bad). Yep, my tap was a gift for a previous birthday. It also helps if you know people who go to Germany on a fairly regular basis! What I like about the taps is that you can use either CO2 or Nitrogen - my next stout (or maybe Irish Red Ale) will be served with nitrogen. I just like the kegs because the give me flexibility. They aren't perfect and not necessarily cheaper than cornies but I do like the flexibility they provide! Last edited by lambert on 16 Jan 2013, 23:06, edited 2 times in total. Sorry PP, missed that one question - yes, I do buy my kegs new. Last edited by lambert on 16 Jan 2013, 23:38, edited 2 times in total. Thanks for the PM re the tute . Wonder if anyone knows if you can get the kegs here in Ozland? Never seen them before . PistolPatch wrote: Thanks for the PM re the tute . It wouldn't cost much to ship them in. They are thin steel and weight next to nothing. Last edited by Yeasty on 18 Jan 2013, 00:58, edited 2 times in total. I just found this thing called Google - good on me!!! In Ozland, looks like you can get mini kegs here. Says there that you can get ten uses out of each keg. I thought they'd be unlimited. How do you know when they're buggered? Do they blow up or something? Last edited by PistolPatch on 18 Jan 2013, 05:58, edited 2 times in total.